First Line: In the beginning, I behaved badly. New York City gallery owner Ethan Muller has been tipped off that one of the tenants in a building has disappeared, leaving behind some very strange, very original artwork. When Muller goes to take a look, he is-- quite simply-- blown away by the originality of the art... and its potential for making a lot of money. When the art goes on display in Muller's gallery, it draws the attention of the police because the subjects of the pictures look exactly like the victims in a cold case from several years ago. Ethan begins receiving letters telling him to stop displaying the art, and he and the police both think that the missing tenant is either the link to a murderer-- or the murderer himself. When I begin reading a book, the only real expectation I have is that it will be good. I don't care how it gets me to the Land of Good, I just want that to be my destination. Unfortunately my train to the Promised Land was shunted off on a siding and never made it to the end of the line when I read The Genius. The Genius is more family saga than thriller. Criminal investigation in this book is not all glitz, glamour, action, and suspense. Here it's quite a hard slog to get to the answers. The premise-- who is the missing-- brilliant if eccentric-- artist named Victor Cracke is the one thing that kept me going clear to the end of this book. The only thing I really found interesting was the background information provided on the cutthroat art world. All the characters left me cold. When I finally learned the identity of Victor Cracke, I discovered that I'd been led in, through, and out of the (to me) tired story of a rags-to-riches family who covered up and denied much in order to retain its veneer of respectability-- at great cost to those who needed its love and protection the most. It was a story that I just was not in the mood for in any size, shape, or form. 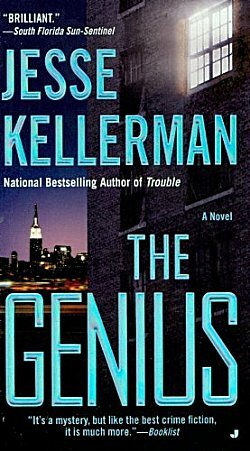 There are times when I have no patience whatsoever for the type of people Kellerman's story was all about. This was one of those times-- which means your mileage most certainly will vary!